Written by Robert Louis Stevenson and published in 1883, this MGM spectacle from director Victor Fleming found it’s way into movie houses forty years after the writers passing at the age of just 44. 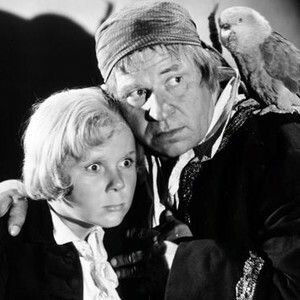 This big screen adaptation was the first talking version of the novel and cast Wallace Beery as Long John Silver who was just coming off an Oscar for his role as The Champ. 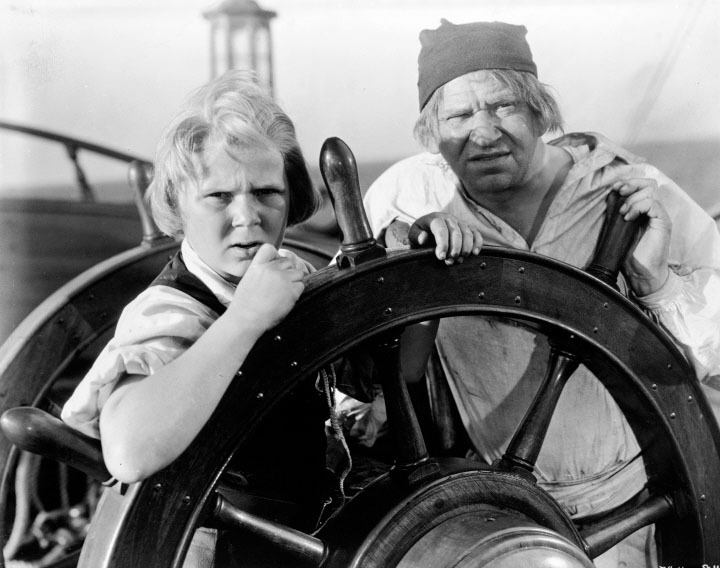 The studio wisely recast Beery with his Champ co-star, child actor Jackie Cooper in the role of Jack Hawkins whom the story revolves around. 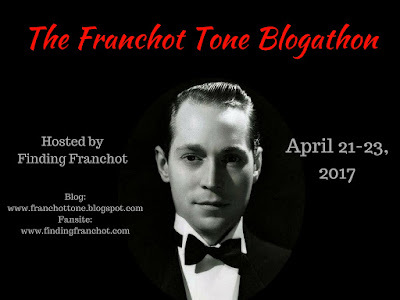 Fleshing out the cast are some names/faces that still resonate with today’s film buffs, Lionel Barrymore, Lewis Stone, Otto Kruger and Nigel Bruce among others. Is it safe to say the majority of us know the basic story? It’s been filmed enough to give most every generation an opportunity to see “the all new version” as a kid. 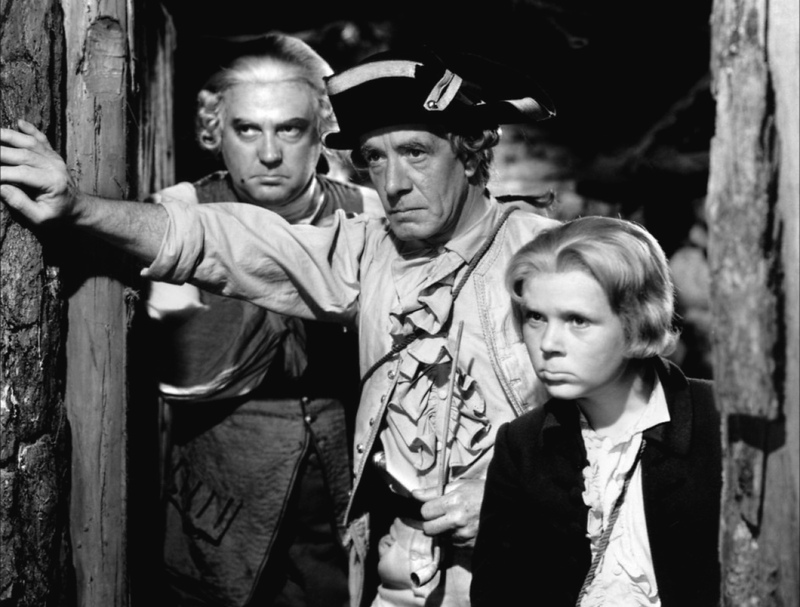 Quickly, it’s the story of a young boy played by Cooper tangling with a gang of cutthroats led by the peg legged Beery and the boy’s subsequent relationship with the pirate leader. One that will border on hero worship as Beery takes on the role of a substitute father for the youngster. 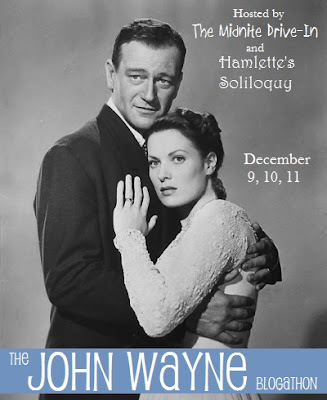 Don’t be shocked to see Lionel Barrymore hamming it up as Billy Bones who takes a room at the inn run by Cooper’s Mother. 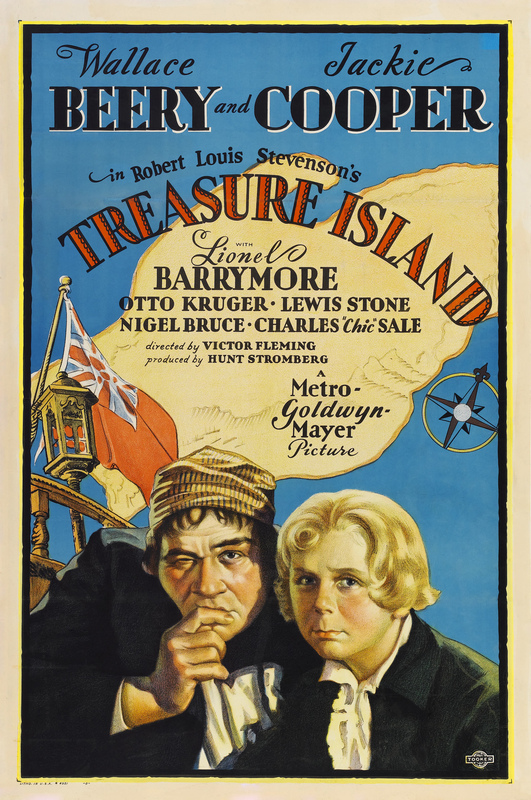 Barrymore serenades us with a less than stellar “yo ho ho and a bottle of rum” and when a creepy old pirate named Blind Pew turns up, Barrymore’s elongated cameo is coming to an end. Now it’s time for the adventure to start. 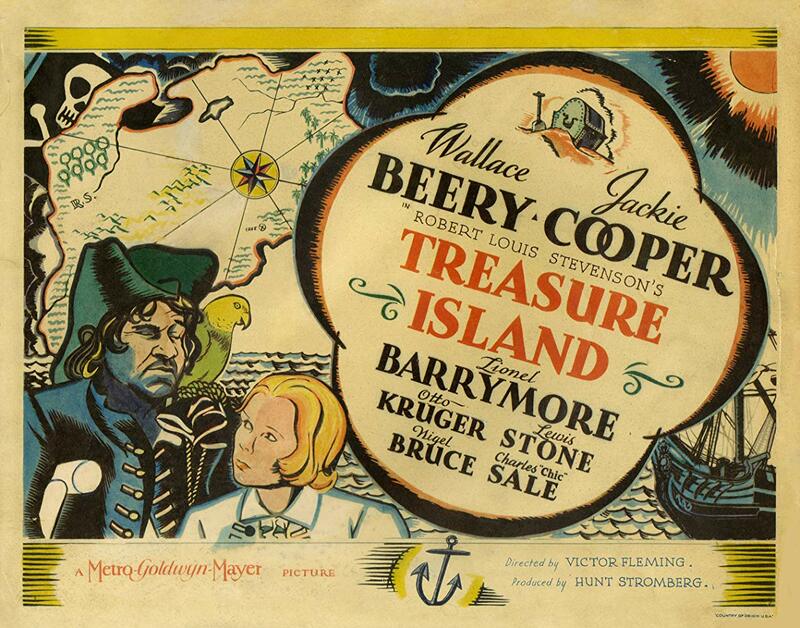 Cooper finds a treasure map that Beery and company are after among Barrymore’s belongings. Like a good lad, he’ll share his find with Stone, Kruger and Bruce and the quartet are off on a seafaring adventure to find the spot marked X on the map. The biggest problem is that Beery has signed on to the voyage as the ship’s cook and on his say so has supplied Bruce with a crew. A crew of pirates loyal to Beery. Mutiny is in the air on this voyage. Sides are going to be taken and if your not careful you just might find a dagger in your back. Once on land it’s Beery’s cutthroats versus Cooper’s noblemen. Musket fire and swordplay follow leaving many dead and Beery exclaiming, “This boy’s got more fight in him than the whole lot of yah!” in reference to Cooper’s adolescent cabin boy. Though Beery and Cooper are on opposing sides there’s just no way he’ll let harm come to the lad. There’s still a treasure to be located and debts to be paid and with Beery being a murdering scoundrel what’s the Hays Code going to do with him at the fade out? Is he to hang from the nearest yard arm? 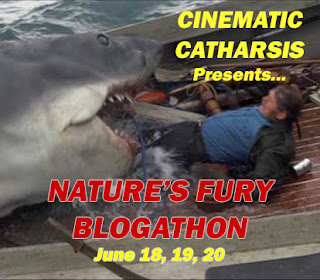 Tune in and find out if you already haven’t seen this piece of grand old entertainment. Has this aged well? 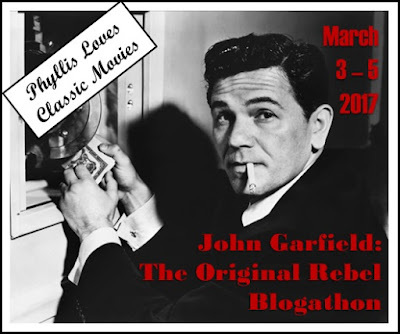 I suppose not to today’s crowd of movie goers but anyone who has a love for classic thirties cinema are going to love this MGM take on the famous Stevenson novel. This was my first go around with the Beery film and I’ll be the first to admit the opening half hour wasn’t exactly knocking me off my lounge chair in the movie room. That’s mainly due to Barrymore’s hamming and the fact that Beery is winking at the camera constantly to ensure the audience is in on his scheme. Really! Were audiences that simple back in the day that they needed to be coddled along on key plot points? I wouldn’t think so in part because I’d wager a fair sum of money that audiences in 1934 had a higher rate of those who have read the novel than if I were to take a poll of people who ventured in to see Disney’s updated Treasure Planet cartoon of 2002. On the topic of Treasure Planet, there are of course numerous adaptations of the story. 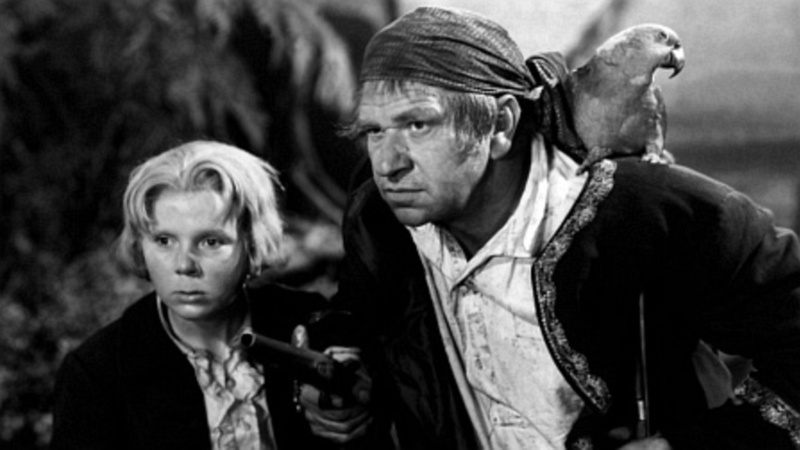 Some memorable like the Disney version of 1950 with Robert Newton as Long John Silver which warranted a follow up in 1954. Do everything possible to ignore the 1972 Orson Welles flick and I’ll leave you to your own judgement on the 1999 Jack Palance effort. Now one I will recommend is the star studded 1990 version that was a made for cable production as it’s hard to top Charlton Heston as Silver, Oliver Reed as Billy Bones, Christopher Lee as the terrifying Blind Pew and a 16 year old kid named Christian Bale as Jim Hawkins. 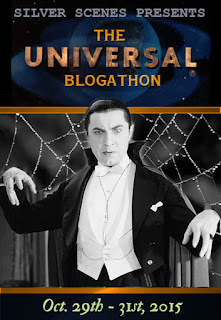 On a sad note there is supposedly a lost version from 1920 that saw Lon Chaney in a dual role. One of which is Blind Pew. Keep your eyes peeled to the TCM listings or pick up a DVD if given the chance and turn the clock back to the days when MGM scored more stars then there were in the heavens.